Blowout Sale! Free Shipping Included! 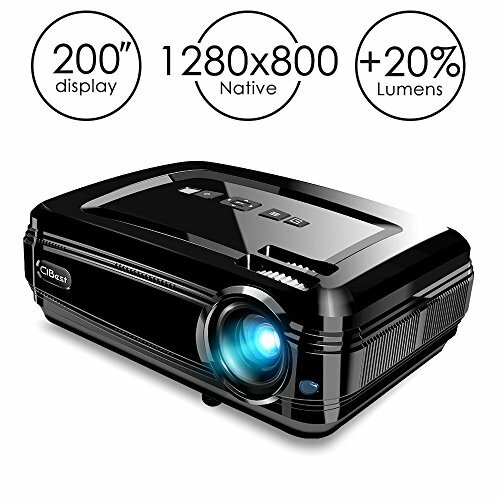 Save 77% on the Projector, CiBest BL58 LED Video Projector 1080P HD with +20% Lumens High Brightness for 200” Home Theater Support HDMI/USB/VGA/AV/SD to Laptop iPhone/iPad & Smartphone for Home Entertainment & Party by CiBest at FloType. MPN: BL58-B. Hurry! Limited time offer. Offer valid only while supplies last. HIGH BRIGHTNESS & HIGH RESOLUTION: Thanks for the latest LED technology, CiBest BL58 HD LED projector is 3200 lm with 360 LUX color/white brightness, couple with 3000:1 contrast ratio and 1280x800 native resolution (support 1080P), you may enjoy a super vivid image which is much brighter and sharper than other same level models. This projector is ideal for home entertainment in dark, but NOT highly recommended for PPT or business presentations. CINEMA-LIKE BIG SCREEN EXPERIENCE: Cibest BL45 video projector delivery a 36~200" big screen experience with 3.6~20ft projector distance, perfect for you to relax yourself to enjoy movie or games in cinema-like atmosphere. We recommend the best projection performance 100" by about 7ft distance. STRONG MULTIMEDIA CONNECTIVITY: BL45 projector is your perfect home entertainment devices which provide HDMI/ VGA/ USB/ AV connections to compatible with TV Box, Amazon Fire Stick, Chromebook, PC, Laptop, Tablet, DVD player, USB Flash Drive, Media players, iPad, iPhone, Android Smartphone. HDMI dongle (not included) is needed to connect your Android smartphone (support MHL function)/ iPhone/ iPad to the projector. UPGRADED OPTICAL & COOLING SYSTEM: CiBest BL58 video projector is equipped with an innovative cooling system with heat dispersion, as well as the fan noise cut in half. Advance optical technology provide 30,000-hour long lasting lamp lifespan. CIBEST IS YOUR ONLY SAFE CHOICE: We provide a Hassle-free 3-YEAR warranty, professional Customer Service & Technical Support. If you have any problems, please feel free to contact us. If you have any questions about this product by CiBest, contact us by completing and submitting the form below. If you are looking for a specif part number, please include it with your message.